Kinshasa (Agenzia Fides) - There are 3,383 victims of violence in the Ecclesiastical Circumscriptions of the Grande Kasai in the Democratic Republic of Congo, registered from October 2016 to present. This is what the Apostolic Nuncio in Kinshasa states in a note sent to Fides. The Great Kasai is shocked by the clashes between the Congolese army (FARDC) and the militiamen of Kamuina Nsapu, a local leader killed in a clash with the police in August 2016. 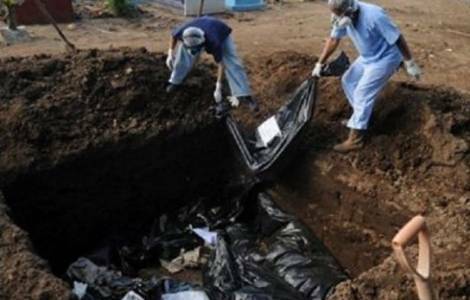 According to the note, the mass graves discovered so far are 30, the villages completely destroyed are 20, of which 10 by FARDC, 4 by the militiamen and 6 by unidentified groups; 3,698 destroyed houses. The Church paid a very high price due to violence since 4 Ecclesiastical Circumscriptions were affected: Kananga, Mbuji-Mayi, Luiza and Luebo. The dioceses marginally involved are those of Mweka and Kolwezi. Two Bishops were forced to exile: His Exc. Mgr. Félicien Mwanama Galumbulula, Bishop of Luiza, and His Exc. Mgr. Pierre-Célestin Tshitoko Mamba, Bishop of Luebo, whose house was destroyed. 60 parishes closed or damaged; 34 religious houses closed or damaged; 31 Catholic health facilities affected and 141 Catholic schools closed or damaged. 5 Seminars were forced to close, of which 2 are Major Seminars.